Back row, left. Evelyn (born 1914), Anne (1913), Bridie (1908), Michael (1911), Mary (1905) Marguerite (1909), John (1916). Front row, left: Frank (1918), Michael O’Donnell (father), Leila (1925), Patrick (1924), Genevieve (1923), Margaret (Doogan) O’Donnell (mother), Philip (1920). When we were children, my brother and I spent our summers in southwest Donegal in the village of Kilcar, with my mother’s people. Our parents sent us there so they could build their business in Buncrana, a tourist town 100 miles north. For me the journey southwest was an opportunity to switch one thriving location for another that was wild and a bit mysterious. Harry Percival Swan has called Donegal “a most fascinating playground.” In his 1949 book, Twixt Foyle and Swilly, he writes that, “Whoever spends one holiday amid its varied scenes will come back and spend another . . . Its sheltered landlocked bays, towering sea cliffs, and dark lonesome sea caves; its streams, and lochs, glens, and hills, will attract the lover of wild romantic scenery, the naturalist, and the wearied worker who desires to obtain a pleasant, quiet, invigorating place.” Swan had it right. Stillness and silence assure Donegal its integrity. It was my good fortune to spend childhood summers with my widowed grandfather Michael O’Donnell and my uncle John’s family, who lived with him. For me, Kilcar was a different Ireland than where we lived. 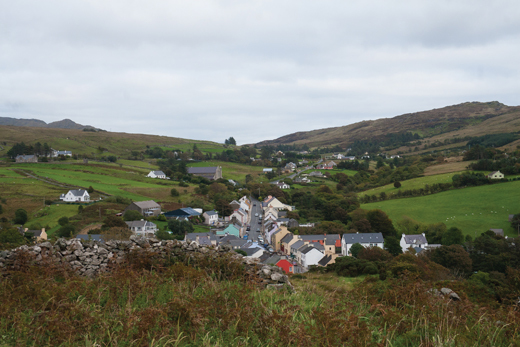 Even the language was foreign; it is a Gaeltacht village, so they spoke Irish. Today about a quarter of the locals remain native speakers. In those days of the late 1950s Kilcar was a hinterland, but today it’s a tourist destination, attractive for its scenery, rock climbing, surfing, family bathing beaches, and cultural traditions, especially music. Outside the village are the Slieve League cliffs, with beautiful coastal landscapes. Though less famous than the Cliffs of Moher in County Clare, Slieve League’s cliffs are almost three times higher. They are described as the most varied group of alpines in Ireland. As children we were unfazed by the scenery but quietly influenced by nature’s beauty. The village consisted of a main street with a Catholic church at one end and two textile factories at the other, with shops and pubs in between. The village still has the principal tweed facility in Donegal, with shops selling tweed and woolen products, a big part of the Kilcar economy. The raw materials for that industry were and still are abundant in the area. Sheep, bred for wool, thrive in the hills and bogs of Donegal, and indigenous plants such as blackberries, fuchsia, gorse, and moss provide dyes. View from the monastic site at the old church down to the village, looking east. The main road is seen as it leaves Kilcar in direction to Killybegs. My grandfather was a weaver and he had a handloom in an outbuilding of his yard. My uncle was a contractor, also busy making concrete bricks there. The family managed the local dance hall, which I loved most. Our house controlled the electric lighting system of the village. The flow was turned on and off with the lever in the front hall. I’m not sure if my brother and I ever pulled it, but the lever was a definite temptation. Granddad was also a fiddler and in the evening he would take his violin and play as we danced around the kitchen. All my uncles were in St. Cartha’s Pipe Band, formed in Kilcar in 1934. The band continues strong and competed in the All-Ireland Pipe Band Championships. A precious reminder of that time is a photo of my mother and her siblings, as village children who later left to start families in Ireland, England, and America. My mom, Bridie, third from left in the back, wearing a tie, was the second eldest and always a fashionista. One of the first women to be trained to run a post office in Ireland, she herself was posted to Buncrana, where she met my father. A few years later, they started their own retail business. Uncle Paddy owned O’Donnell’s Pub in Astoria, Queens. His sister Leila, the youngest girl, who sits on the lap of her father, my grandfather, became a nurse in England and from there emigrated with her husband Jim Dolan to the U.S. They too settled in New York, where she became head nurse at Boulevard Hospital in Queens. We are descended from Hugh and Molly Gildea (neice of Cardinal O’Donnell )of the Beehive Bar Main Street Ardara through their daughter Columba Gildea our mother. We too spent our summers in Donegal in Ardara playing in Main Street and the lovely environs. Eveline Gildea my mothers older sister used to talk of a connection with Kilcar. The Gildea’s were Patrick, Mona, Eveline, Patricia, Ena, Frances, Columba, Loretto (the only one still alive 90 next year).